First off, I wanna say that the road house depicted in Road House is AWESOME. It’s low-ceilinged, built like a log cabin. There’s a bowling alley, a bar, a sporting goods store, and Ida Lupino playing piano. This is the coolest (fictional) joint west of Chicago. Now if it wasn’t for the tension between its manager and owner, Jefty’s Road House would be perfect. 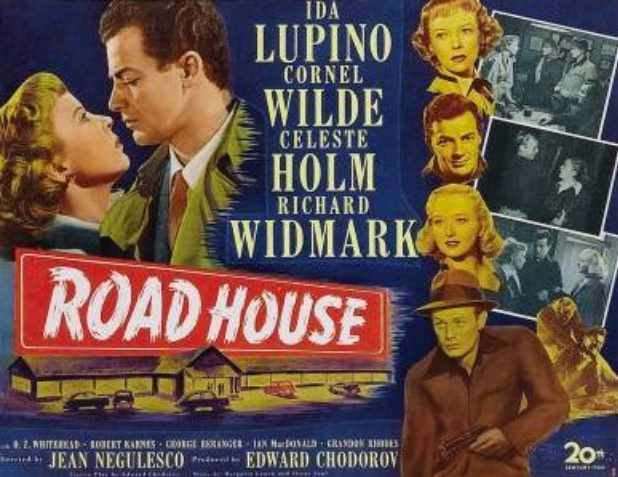 After Richard Widmark struck it big with Kiss of Death and Street With No Name, Ida Lupino personally requested that he play in Road House, which was her star vehicle. He essentially plays a variation of Tommy Udo, with the psychotic tendencies clicked down a few notches. But ho boy does he resurrect that beautiful, unnerving laugh from hell. Road House, directed by Jean Negulesco (Mask of Dimitrios), has a simple story infused with brilliant dialogue and heaps of noir aesthetics. Man, I really love this sharp little movie.